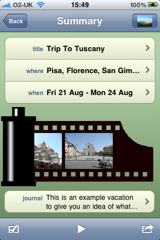 Jasper Apps announced the release of My Vacation for iPhone and iPod Touch, available now on the App Store. My Vacation is an app for travelers which is packed with features, all within the app rather than simply being an interface to a website, with yet another log in. Regardless of network coverage the interface makes it simple to capture the memories of a trip, rather than let them be forgotten. Once back from vacation, despite best intentions, there is rarely the time or inclination to spend time on a computer to record what happened and to label the photos taken. My Vacation harnesses the iPhone interface, camera, and GPS to encourage users to update a journal during the vacation. Plan activities and what to pack before the vacation. Take photos and video during the vacation, together with captions and location data. Write or record audio journals for each day. Interactive playback of the vacation including maps, photos and journals. Upload photos and journals to Facebook, Twitter and email. Pricing and Availability: My Vacation is available at an introductory price of $3 (USD) and available exclusively through the Apple App Store in the Travel category.